PanARMENIAN.Net - The project titled “Let there be light” (lat. Fiat Lux) is sponsored by RECOM, one of the fastest growing companies in the European solar industry. In a conversation with PanARMENIAN.Net , Optimum Energy representative Armen Gharibyan said the initiative includes energy audit, events on energy efficiency, installation of solar water heaters and photovoltaic array. The amount of investments exceeds $2 million, according to him. Energy efficiency and renewable energy consultant, energy auditor Hovhannes Tevosyan commented to PanARMENIAN.Net on the current and future projects in Holy Etchmiadzin. The religious and administrative buildings in Holy Etchmiadzin will henceforth have hot water heated by the sun. “The water will be heated by solar energy, which will allow saving 65,000 cubic meters of gas annually,” Tevosyan said. The project will be completed in August. Solar photovoltaic array, a system made up of a group of solar panels connected together, with a total capacity of 1MW will be installed in the environs of St. Gayane church. The amount of solar power produced by a single photovoltaic panel or module is not enough for general use. Most manufactures produce standard PV panels with an output voltage of 12V or 24V. By connecting many single PV panels in series (for a higher voltage requirement) and in parallel (for a higher current requirement) the PV array will produce the desired power output. 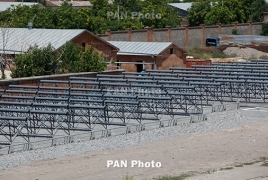 Tevosyan said the solar array in Etchmiadzin will combine 2880 modules that will generate 1,600,000kW of energy annually, which amounts to $140,000, according to the current rates. The project will be completed in two or three months. According to Optimum Energy representative Armen Gharibyan, the Solar Park will be built next to the photovoltaic array. It will become a place for people to walk around and also visit a training center, where the latest achievement in solar energy will be presented. Mother See of Holy Etchmiadzin has conducted energy audit to determine the measures for each construction. “For example, examination revealed heat leak through the windows in new Matenadaran. To fix it, special tape will be stuck to the glass,” Tevosyan said, adding that energy efficiency programs are being implemented for 22 facilities of Holy Etchmiadzin. Improvement of the illumination system is among the energy efficiency programs. About 5000 ordinary bulbs, which consume much electricity, will be replaced by LEDs. Besides, online energy monitoring system will be launched to examine and analyze consumption of energy in each building.